Do you want to enjoy complete hands-free experience for home entertainment while watching movies, reading news with your ipad, cooking dinner while learning recipe on your tablet in the kitchen for family? Do you want to be more productive on work tasks with your ipad being a dual-screen for your laptop at office? Do you want to make your business transaction smoother and faster at restaurants, shops, Café, or any commercial retail store? 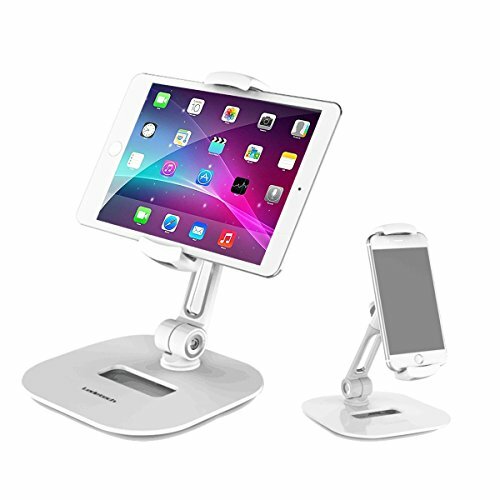 Homeleader Tablet Holder is one of the most compact and versatile ipad mini stand in the market. The Tablet stand has a heavy base for greater stability. It has rubber feet to prevent damage to the surface on which it is placed. -For most smartphones and tablets with diagonals up to 13'' including: iPhone, iPad, iPad Air, Kindle, Samsung Galaxy, Google Nexus and more. - 360° rotation and 7 adjustable parts for your great health benefits with good posture, neck relaxing and various viewing angles.Rotation/fixed at any angle. - Customize tightness of the arm rotation by using included hex wrench. Flexible adjustment：Designed to rotate 360 degrees for ease of use. Perfect for for home entertainment, shops showcasing as square stand, office display. Perfect hands-free convenience for seniors at home enjoying modern technology.